Friday, December 17th was a momentous day in the long struggle of the people of Ecuador's Amazon rainforest region ravaged by oil giant Chevron, formerly Texaco. 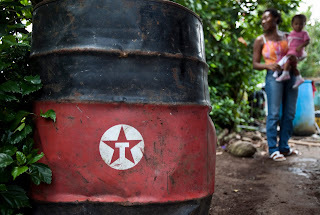 On Friday, More than 17 years since Ecuadorians filed a lawsuit demanding cleanup of Texaco's oil contamination, the judge declared a close to the evidentiary phase of the trial, paving the way for a judgment in the historic case. Sucumbios Provincial Court Judge Nicolas Zambrano declared autos para sentencia – the end of the evidence phase of the trial and the beginning of his deliberations over the massive case record, some 215,000 pages of relevant documents. "The proof phase has been concluded. I have to read what there is in these proceedings and, based on this criteria, issue the corresponding decision." A Wall Street Journal article reported what many observers believe, that a ruling from the judge is "expected to be ready in the first quarter of next year." Of course, many predictions have been made over the years, and others close to the case say that a judgment could come anytime between February and next fall. Regardless, it means a judgment is finally coming in the case, despite Chevron's myriad, creative, and cynical attempts to delay a ruling indefinitely. "This decision should put an end to Chevron's continued abusive litigation tactics intended to perpetually delay the resolution of claims that affect the lives of thousands of innocent people." Pablo Fajardo, lead lawyer for some 30,000 indigenous and campesino plaintiffs in Ecuador told Pleiteando.com, "These 17 years of trial have shown sustained damage to those who have seen their water supplies, land and air were polluted by Chevron-Texaco. Many of them have already died of cancer and those who survive live in inhumane conditions. At last I see a light at the end of this dark tunnel." So now, as Pablo explains, even with the evidentiary phase in the trial over, it's important to continue to keep a spotlight on this case, as Chevron has deployed extraordinary resources to delay and disrupt the trial. With a new scorched earth legal strategy designed by its attack dog lawyers from corporate behemoth law firm Gibson Dunn, they have been successful at creating chaos, and forcing the plaintiffs lawyers to defend themselves against all kinds of accusations. But with a judgment on the horizon, the plaintiffs have also brought on a major new ally in the form of their own corporate law behemoth, Washington DC-based firm Patton Boggs. Responding to Chevron's well-worn accusations about the case, James Tyrell at Patton Boggs told American lawyer magazine's Michael Goldhaber, "I'm certainly not here to join in any fraudulent effort. We cannot be exposed to liability when we have been hired to do the opposite: to make sure that the final judgment is free of fraud. My mission is to see that a judgment on the merits, warranting international respect, is entered in Ecuador, and, if we win, to enforce it." Enforce it? Yes, this is critical. It's important to remember that Chevron left Ecuador in 1992, and no longer has assets there. So, even if all goes well for the Ecuadorians, and a judge awards them billions from Chevron to remediate the company's widespread pollution, and provide clean water and health care infrastructure to affected communities, the plaintiffs will have to take that judgment to the courts in places where Chevron does have assets and lay claim to them there. That's where big guns like Patton Boggs come in. Unfortunately, that also takes time, while people continue to suffer. Watching this saga unfold over the years, it's hard to imagine Chevron shifting gears. I expect that the company will continue to try to shift the blame, attack the plaintiffs lawyers, try to evade a judgment through arbitration and other "end-runs" around the legal process, and whatever other tricks may still be up their sleeve. For the sake of the communities living around the company's former oil sites, I hope I'm wrong, and that Chevron's honchos will decide it's time for them to stop fighting this losing and dishonorable battle, and finally do the right thing. Why nust something so evident take such a long time? Who is hurt and who benefits? The destruction of our planet is in free fall while we delay the obvious!